Not sure you actually grasp Americans Phil, let me attempt to translate what the American is actually thinking in your grid. In all the "What the Brit sez" cases, except for the bottom two about the arse and the pint, the American is thinking, "My God, yet another arrogant Brit, well, I will play along and see what else he says." Regarding the arse, the American is thinking, "I might just kick your self-righteous arse." Regarding the pint, the American is thinking, "Have you ever heard of a six pack?" The communication gap continues. This list could go on and on! Thanks for the Monday morning humor, Phil. Ha, actually that is a pretty typical American reaction. The comment was written from a research perspective. Then there are Anglophiles, on the other extreme. And then there are those minority of Americans who just view people as people, or try too. Personally, I aim for the last approach, but undoubtedly fall into the first two from time-to-time, I mean, who couldn't love Princess Diana? Somehow I don't think Millwall supporters would use this kind of language. 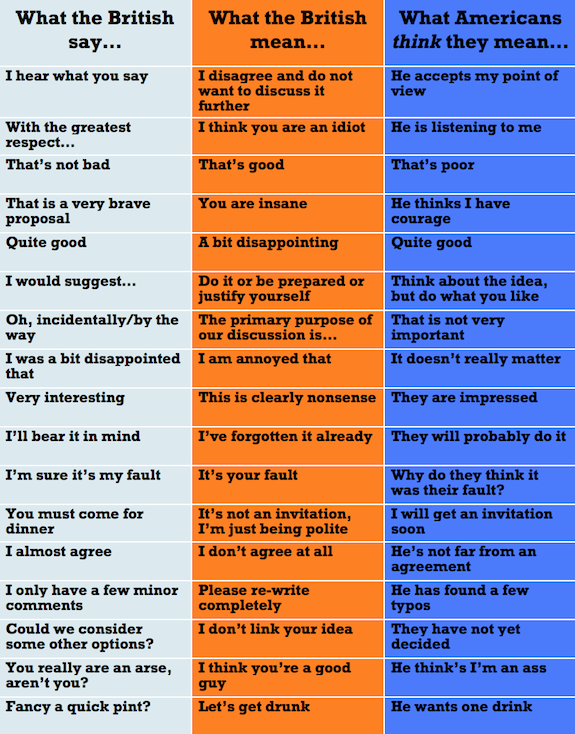 Though I find a number of the British/American (USA) misunderstandings humorous I don't find them accurate to my experience. I find myself in the somewhat unique position of having traveled over half the world by age 23 and therefore having experienced, early on, a broad manner of speech issues with many people of varied origins. That said though, a number of my friends of American (USA) origin who have not traveled extensively (or even much at all) would have a great misunderstanding - as posted above. I must disagree vehemently with Evan Quinn's opinion of what "...the American is thinking,..." for many reasons beyond than it is just offensive and puts Americans (USA) in a bad light. Also, the comment, “Have you ever heard of a six pack?” speaks VOLUMES! And lastly, I apologize for my verbosity.